Emojis are small digital images or icons that are used to express an idea, feelings etc… in electronic communication. They are mostly used during texting or in social media. Kids, tweens, teens and even adults love using emojis. They are so popular that there is even an emoji movie. I knew that doing anything with emojis the kids in our camp would love, and I was right. We did this craft in our summer camp program for ages 5-16 and it was a big hit with all the age groups. It’s a great camp craft or fun to do with the kids at home. The kids really enjoyed being creative by coming up with the different emoji faces. 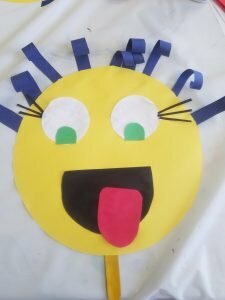 This craft is fun for the big kids yet easy enough for the little kids. Follow the step-by-step directions below to make fun emoji faces. Step 1: Have the kids trace large circles on the yellow paper for the emoji face. For the younger kids I had pre-made some circles. Step 2: Have an adult hot the popsicle sticks to the back of the yellow circles. Again, I had the circles cut and the popsicles sticks glues on before the kids came in to do the craft. Do, whatever works for your group. 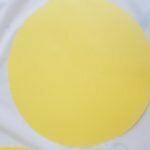 Step 3: Have some pre-made shapes or let the kids cut out shapes to glue on their emoji faces from the colored construction paper. Here where it gets fun. 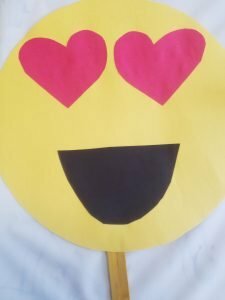 Encourage the children to use their imgaination and come up with fun ideas to add to their emoji faces. One of our kids made hair on his, another made there’s look like it was wear lipstick and eye shadow and had lots of bows.